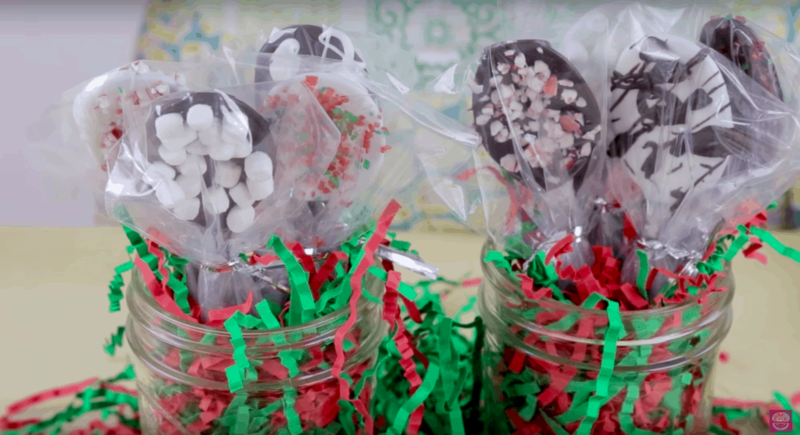 10 Last Minute DIY Christmas Gifts: Easy Edible Goodies! Who’s on your Christmas gift list? And have you checked them all off yet? If not, don’t fret! You’re definitely not alone. Trying to buy the perfect gift for each person on our lists is HARD. Plus, it can be stressful and expensive… Luckily, you can find 10 delicious solutions to your problem right here: last minute DIY Christmas gifts! All of these are healthy, edible DIY Christmas gifts, and they’re easy to make in just minutes. But, they will look and taste like classy gourmet treats! And really, what better gift to give than a healthy, tasty treat? We’ve all gotta eat, we all love to eat tasty food (let’s be real), and sharing food with one another is one of the best ways to show someone that we care. Rather than dealing with gift-giving anxiety and blowing your savings on Christmas this year, invest a little bit of time in these last minute DIY Christmas gifts! They’re so inexpensive to make, but they’re far more personal than any gift we could buy in a store. And, friends and family will surely thank you for bringing major yumminess into their lives. You can find edible DIY Christmas gifts here for all different taste preferences and lifestyle choices—vegan, paleo, low carb, gluten-free, and more! And, get some fun, festive ideas for how to package your DIY gifts with holiday flare. If you’re down to the wire and desperately in need of last minute DIY Christmas gifts, making edible DIY gifts is the way to go. After all, edible DIY Christmas gifts are meant to be made at the last minute so they’re fresh at the time of gifting! Stress less and give the gift of deliciousness. 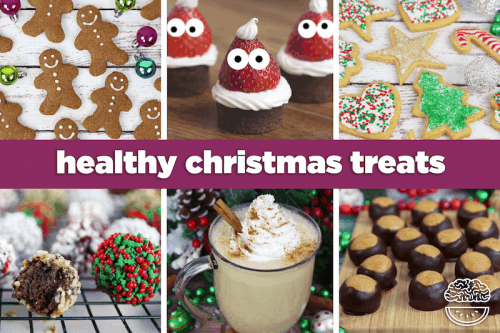 If you’re looking for MORE ideas for healthy edible DIY Christmas gifts, check out our Healthy Christmas Treats blog! There are tons of healthy recipes for gift-able goodies, like healthy sugar cookies, vegan buckeyes, festive chocolate truffles, homemade biscotti, and more! 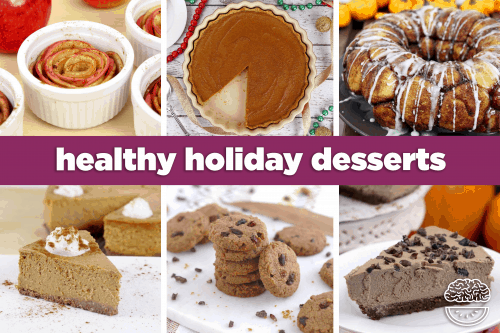 Or, get some sweet inspiration from our Healthy Holiday Desserts post. Store: in a mason jar at room temperature for 6 months to 1 year. ‘Tis the season for hot cocoa! But, don’t let your friends and loved ones waste money buying cups of the chocolaty good stuff. Give them some healthy DIY hot cocoa mix! Perfect for anyone living a vegan, gluten-free, or paleo lifestyle. And, if you use a natural low calorie sweetener like stevia, erythritol, or monk fruit, you can give the gift of sugar-free hot cocoa! This last minute DIY Christmas gift is SO easy to prepare—you just need cocoa powder, sweetener and salt. Feel free to add some mini marshmallows or other tasty mix-ins. Then, decorate your mason jar with festive holiday bells and pipe cleaners for a quick-and-easy personalized gift! Tie on a tag with the directions for how to prepare the cocoa and your DIY Christmas gift is complete. Store: in a mason jar or other air-tight container in the fridge for 2-3 weeks. If you’ve got a foodie or gourmand in your life, this is the perfect DIY Christmas gift to give them! And you won’t believe how easy it is to make. This healthy pumpkin butter is full of seasonal flavor, and it tastes AMAZING on just about anything. Spread it on toast, a banana, or even stir a spoonful into your coffee. Store in a mason jar with a festive cupcake liner sealed in the lid for some simple holiday flare! 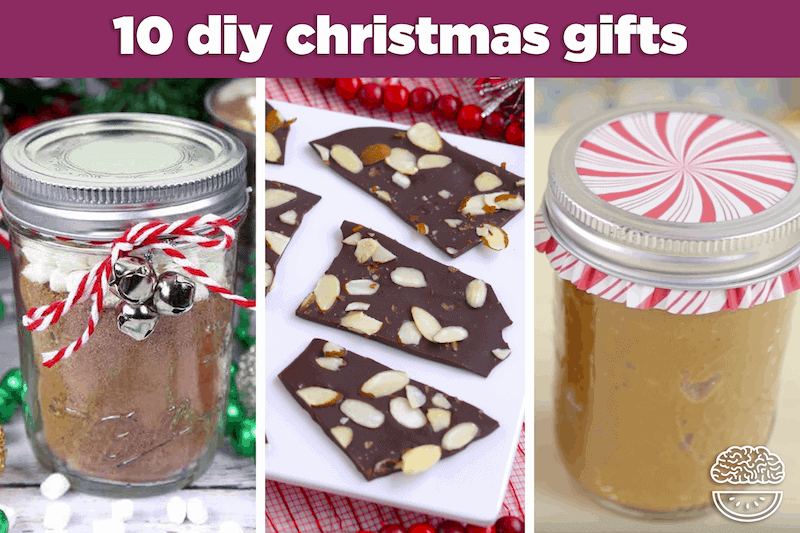 This is a great trick to use for TONS of last minute DIY Christmas gifts, like nut butters, truffles, mini muffins—or anything you can store in a mason jar! This recipe makes about 3 gift-sized batches of pumpkin butter (or one BIG batch). But, if you don’t want to make so much, just cut the recipe in half. Personally, I like to double the recipe so I can give some to everyone on my list! If you’re going through the trouble of making it in the first place, why not go big and share the pumpkin love?? Store: in plastic gift baggies, tied to keep air out. These chocolate spoons are perfect to stir in warm coffee or tea for a more indulgent holiday drink! All you need to make them is the chocolate of your choice, some festive toppings, and plastic spoons. Then, melt your chocolate, dip a spoon in, and sprinkle on toppings while the chocolate is still warm. If you’re really down to the wire, this last-minutest of last minute DIY Christmas gifts can save the day big time. You can use any kind of chocolate you prefer—milk, dark, white, or even dairy-free for a vegan Christmas treat! Crushed peppermint, mini dried marshmallows, and sprinkles make great toppings, but the possibilities are really endless. Turn them into a gift by wrapping each spoon in a small plastic gift bag and seal with a twist tie. And, for your favorite coffee lover, put multiple chocolate-dipped spoons inside of a mason jar “vase” filled with holiday confetti paper or tissue paper! Nutrition will vary based on type of chocolate and toppings. Store: in air-tight container in the fridge for 7-10 days. 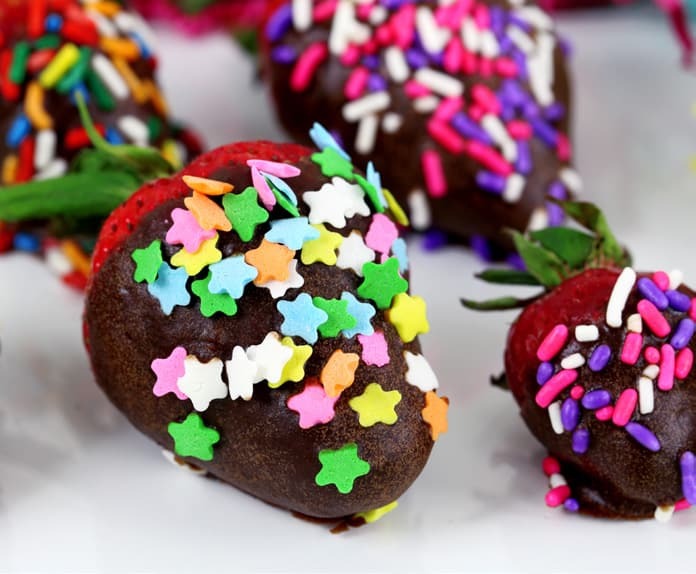 Here’s a sweet treat that was designed for Easter, but they’re delicious enough to enjoy anytime of year: chocolate covered strawberries. It’s a super quick and easy recipe that’s completely VEGAN when you use this vegan chocolate coating! It’ll harden up even outside of the fridge, but I recommend letting your dipped strawberries set in the fridge for best results. Plus, you can use that simple vegan chocolate coating for TONS of other last minute DIY Christmas gifts, like healthy chocolate truffles or homemade vegan Reese’s candies! Make this gift your own with any number of tasty toppings. Festive holiday sprinkles are a great choice, or roll your berries in some chopped nuts, coconut shreds, or even drizzle with melted white chocolate! You can package these up in a mason jar or Tupperware with some festive decor. But, just be sure the container can store easily in the fridge! Store: in an air-tight container in the fridge for up to a week, or in the freezer for 1-2 months. 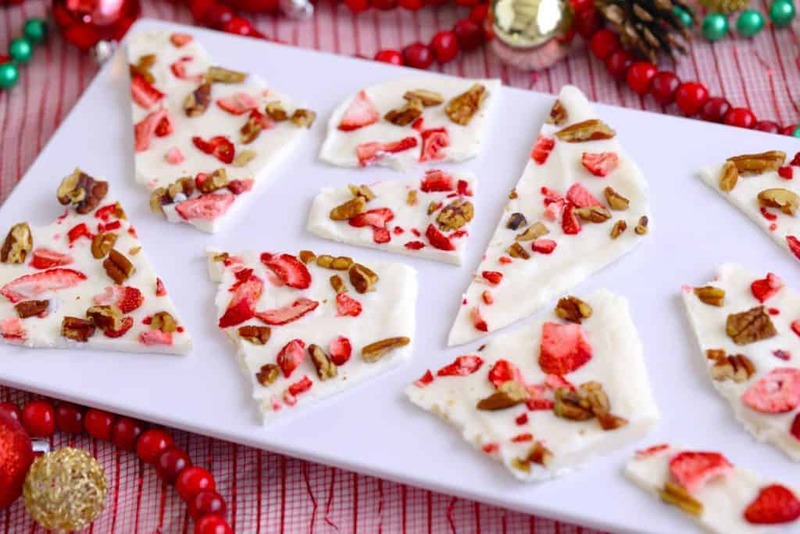 This low fat twist on traditional holiday bark is made with Greek yogurt for a more wholesome treat! Pecans and freeze-dried strawberries add a nice crunch that won’t get soggy after freezing. And, the red and white color combo is bursting with holiday cheer! There are a million holiday bark flavors that you can experiment with, and they’re some of the easiest last minute DIY Christmas gifts you can make. You could even whip up a batch on Christmas Eve! Feel free to get creative with mix-ins to flavor the yogurt, as well as your favorite toppings. 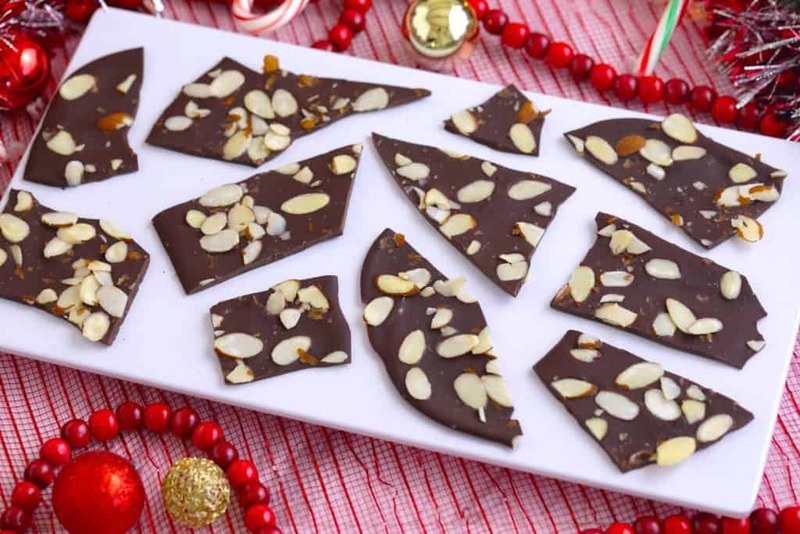 For a more traditional holiday bark, try this luscious chocolate, almond and sea salt recipe! The salty-sweet flavor combo is irresistible, perfect for any chocolate lover. But, this is no ordinary holiday bark—it’s vegan, low carb, and SUGAR FREE! It’s an elegant, impressive DIY Christmas gift, but nobody could guess how easy it is to make. When it comes to last minute DIY Christmas gifts, you can’t beat a 5-ingredient treat. 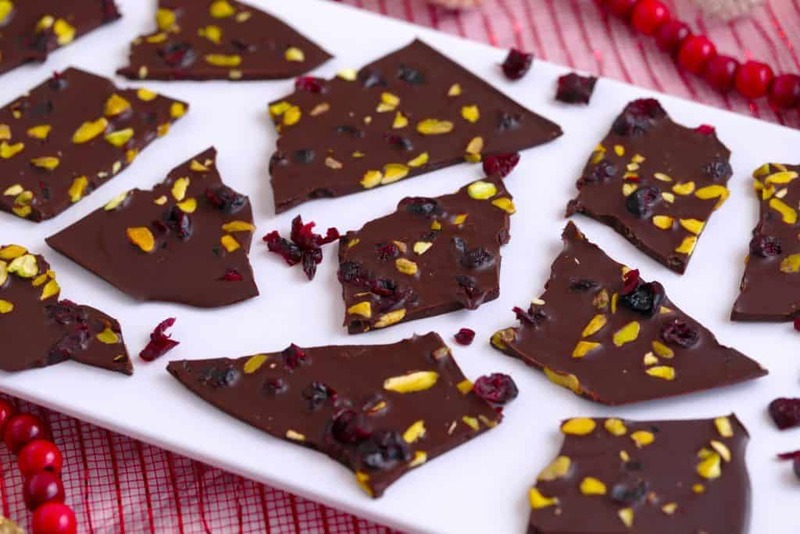 Get festive with this RAW VEGAN holiday bark, made from simple, wholesome ingredients! The dried cranberries and pistachios create a salty-sweet taste and a crunchy-chewy texture that’s so fun to eat. And, they add a splash of all-natural holiday color! Store: in an air-tight container in the freezer for 3-4 months. If someone on your gift list follows a low carb or ketogenic lifestyle, this is the last minute DIY Christmas gift you should make for them. 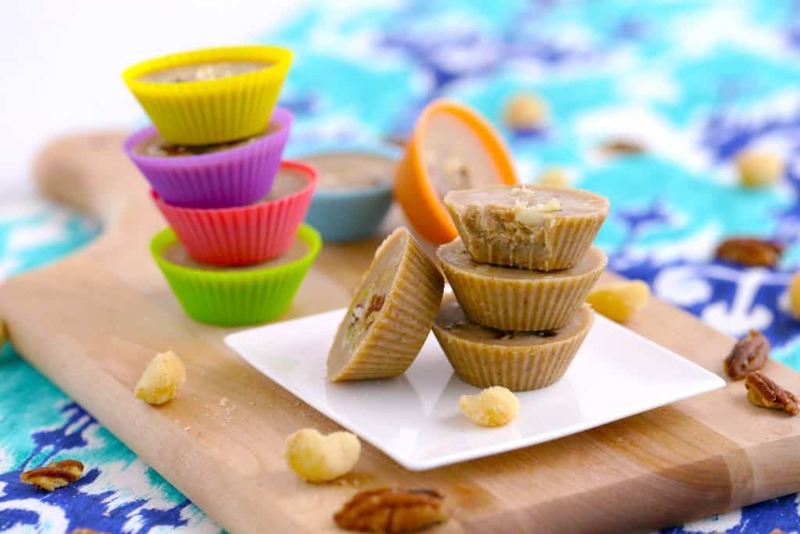 Fat bombs are LOADED with wholesome dietary fat, making them the perfect treat on a low carb diet. Macadamia nuts and pecans create a creamy, buttery texture, as well as a craveable salty-sweet flavor. But, even though these treats are indulgently sweet, using a low carb sweetener keeps them completely sugar-free! Plus, they’re vegan, gluten-free, and paleo-friendly. Store: in an air-tight container or wrapped in plastic at room temperature for 2 days, in the fridge up to a week, or in the freezer for 2-3 months. 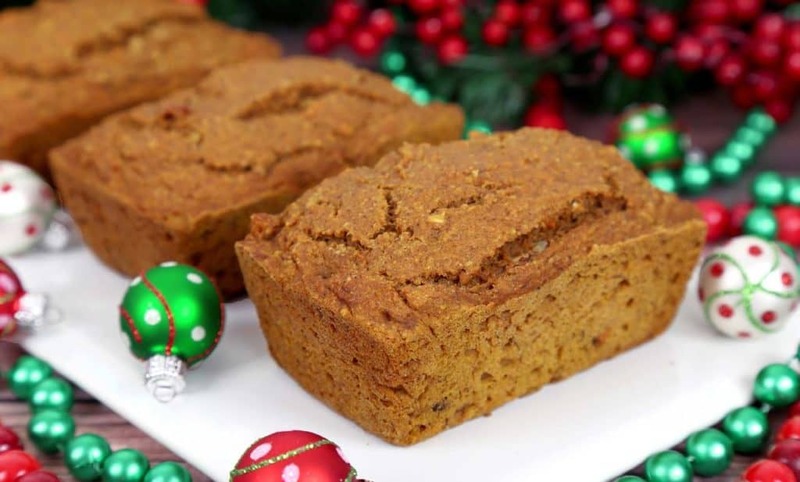 Pumpkin bread is a classic holiday treat that’s great for gifting. But, with this health-ified recipe, you can give the gift of fuel-filled, gluten-free, low-fat pumpkin bread! Mini loaves and mini muffins are the perfect last minute DIY Christmas gifts to divvy up amongst family and friends. Or, bake your batter inside of mason jars for even easier gift-giving—and you can personalize each jar with some extra holiday spirit! Store: in an air-tight container at room temperature for 2-3 weeks. 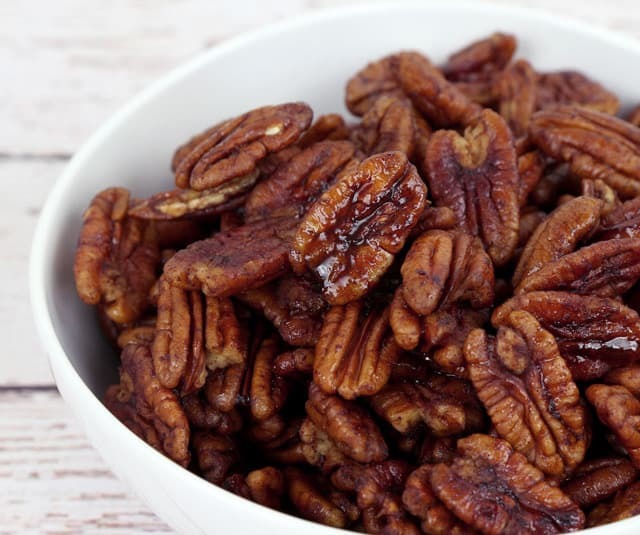 These glazed pecans are so simple to make, you don’t even need to turn on the oven. With just pecans, coconut sugar, and salt, you can whip up last minute DIY Christmas gifts that anyone would enjoy! They’re sweet, crunchy, deliciously crispy, and seriously addicting… But, they’re low in sugar and LOW CARB! 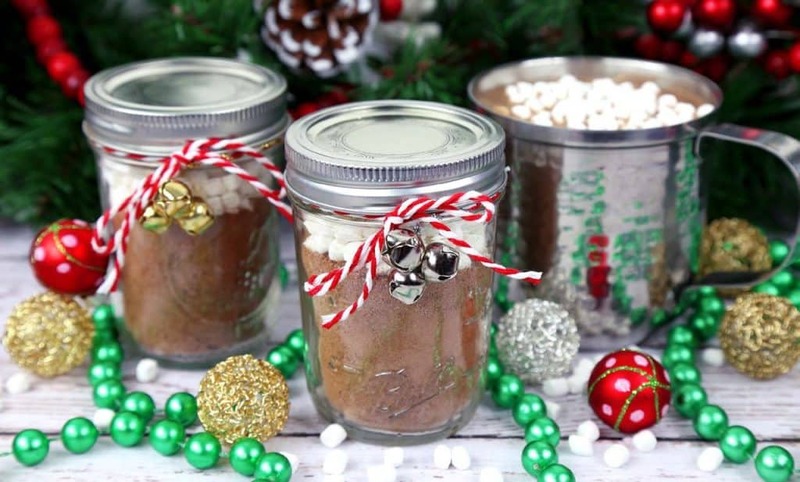 Small mason jars are perfect for packaging these treats—get creative with festive decorations! ALL of these last minute DIY Christmas gifts require less than 30 minutes of your time to prepare! You can let the oven or freezer do the rest of the work. Even if it’s Christmas Eve, it’s not too late to whip up adorable homemade gifts that are amazingly tasty! If none of these 10 last minute DIY Christmas gifts are right for the people on your list, there are plenty more gift-able goodies in our Healthy Christmas Treats blog. 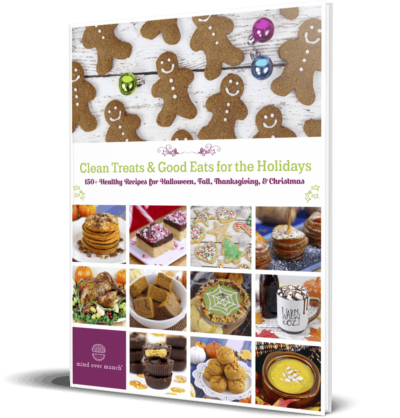 You’ll find recipes for healthy sugar cookies you can decorate, vegan buckeyes, festive chocolate truffles, homemade biscotti, and more! And, you can check out our Healthy Holiday Desserts post for classic Christmas recipes, health-ified. And, find TONS more healthy holiday recipes in my 150 Healthy Holiday Recipes eBook! Healthy DIY Edible Christmas Gifts! Easy Holiday Recipes!